Kirsten Helle Sandoval's four globally inspired sauces make preparing healthy, tasty meals easy and fast. Fifteen ingredients from three different stores for one sauce? Not gonna happen. 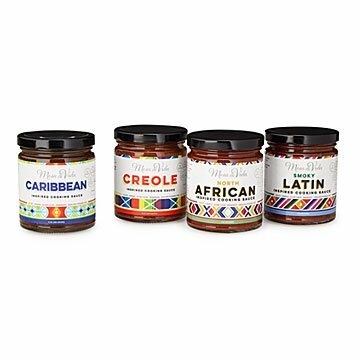 But neither is boring food, thanks to Kirsten Helle Sandoval's set of four all natural, internationally inspired cooking sauces, which make short work of preparing healthy and super tasty dishes. Use them for sautéing, as simmer sauces for grains or beans, as concentrated flavor bases for stovetop or slow/multi-cooker dishes, or as low-sugar glazes. Many prepared foods rely on salt and chemical preservatives. Kirsten, who learned to cook so that she could tackle her own health issues, uses only nutritious vegetables, fruits, and her signature blends of balanced spices and herbs—no added sugar, and a minimum of salt. They're also non-GMO, vegan, and paleo-friendly, so people with varying dietary and allergy needs and preferences can, miraculously, all eat the same dish. Each makes 4-8 servings. Made in Sammamish, Washington. Smoky Latin: (Mildly spicy.) Based on sofrito, it captures bold tastes from Spanish and Latin American cuisines. Use it to make Spanish rice, tortilla soup, Mexican beans, roasted potatoes and tacos. Caribbean: (Medium spicy.) Cilantro, ginger, plums, tamarind, and lime make this a lively flavor base for Jamaican jerk or rice and peas, and pepperpot style stews and soups. Creole: (Medium spicy.) The classic Louisiana flavor blend, for easy weeknight gumbo, etouffée, or jambalaya, or just jazz up whatever you're making in the slow cooker. North African: (Mildly spicy.) Bold, intoxicating, exquisitely balanced, and complex, this mix of spices, sweet plum, tomato, and more makes instant Morrocan flavor possible. Use for couscous, pilaf, tagine, shakshouka, and Moroccan lentil soup. Before she formally studied cooking, Kirsten Helle Sandoval relied on salty, dried packet spice blends, or sugar, salt- (and often chemical-) laden sauces to achieve the global flavors she loved and admired. Once she was a chef, she found that fresh vegetables and fruits combined with pure spice blends allowed the flavors to really "bloom," creating something quite special and delicious. She found that to achieve the flavors she was going for in a healthy, authentic way, she often had to prep tons of ingredients, and spend a small fortune on pure spices and herbs. She became a professional cook for professional athletes. After cooking all day, Chef Kirsten would come home and wish she had these cooking sauces and flavor bases in her cupboard, for making quick, healthy, and tasty meals for her own family. She knew she wasn't the only one with this need. So she started her own company to create them.